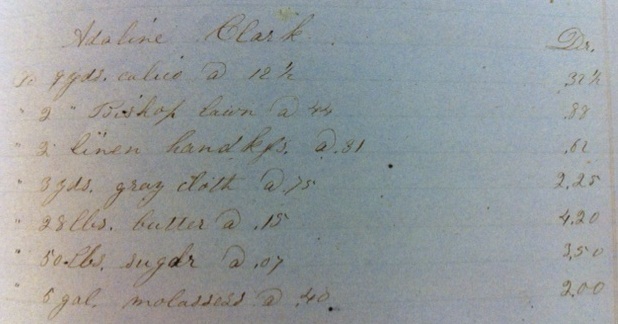 Page of Ardelia E. Ripley’s Practice Account Book, 1856. In 1856 seventeen-year-old Ardelia E.Ripley (1839-1899), the daughter of Samuel E. Ripley and Sarah Cushman, was a student at Partridge Academy in Duxbury. Her Common School Book-Keeping Being a Practical System by Single Entry; Designed for the use of Public Schools by Charles Northend (1853) can be found at the Drew Archives. It is a wonderful example of how students learned the art of basic accounting. While we have numerous day-books and journals used by adults of the period, it is unusual to see one that demonstrates the learning process. Practice books are often thrown away long before they make it into an archival collection. What I find fascinating about the book is what it tells us about society in the 1850’s. Here, in neat script, is a full listing of all the items a person might consider purchasing along with their cost. Duxbury was no longer the prosperous shipbuilding mecca it had once been, but that did not mean its inhabitants didn’t still pine for kid gloves and cashmere. Using her classmates and relations as fictitious “customers” Ardelia itemized a veritable Ante-bellum wish-list. Classmate Frederick Bryant, for example, lavishly spent $6.00 on “1 pair of pantaloons for my hired man” but also more sensibly required coarse salt at 1 ¾ per pound, and even a “white wash brush” for $.63. Girlfriends like Josephine Thomas bought “muslin de laine ($.31 per yard), 2 skeins of silk ($.08).” Ardelia’s young cousin, Walter F. Cushman, required a “silk handkerchief ($.50) and a cravat ($1.50).” Older family acquaintances also made it into her accounts, Capt. George P. Richardson was a regular customer, buying “kid gloves ($.75), 29 yards of carpeting ($21.00), a satin vest ($3.25), 1 yard cambric ($.10) and ½ dozen buttons ($.03)” all in one day. In total Ardelia kept her account book for four months, had eleven customers and over 150 entries with hundreds of line-items. While I have not vetted the prices she ascribed to them, the items themselves are a boon to any researcher interested in knowing what was available to purchase in America at that time. Almost equally as fascinating to me are the people Ardelia Ripley chose to include in her assignment and how they fit into Duxbury history. For example, friend Joseph E. Simmons, who’s name is one of the most prominent in the accounts, would one day die in the Civil War at the Second Battle of Bull Run (see the Duxbury in the Civil War article). Captains George P. Richardson and Daniel L. Winsor were prominent civic leaders. 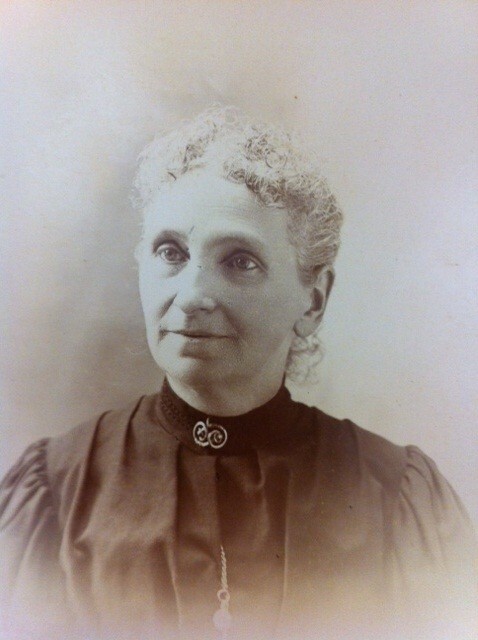 Walter F. Cushman grew up to marry Ardelia’s daughter, Lucie. In 1860, Ardelia herself would marry the keeper of the Gurnet Light House, George H. Hall, and have six children. Her son, Captain Parker J. Hall, was one of the most colorful people to ever live in Duxbury (more on him in a future post). The home of Samuel E. and Sarah Ripley was described in a 1925 The House Beautiful article entitled “The Little Gray House with the Pale-Green Door: One of the Aristocrats of the Cape Cod House.” Ardelia inherited this house and passed it on to her youngest daughter, Lura Cushman Hall. This entry was posted in Uncategorized and tagged 19th century, accounting, bookkeeping, Duxbury, history, journal, ledger, Partridge Academy, Ripley, Simmons. Bookmark the permalink. You can get the ¢ character by holding the alt key and typing 0162 on the number pad of your keyboard. It doesn’t work with the number keys at the top of the keyboard, and not all applications support it, but I see you could have used it here. This is my family. Lura Cushman Hall was my great grandmother. There is a very large Cushman Collection here at the Drew Archives that includes many photographs of Lura Cushman Hall and others in both the Hall and Cushman families. The Cushman house is a private residence but still stands and is quite lovely. Many of Capt. David Cushmans’s belongings are on display at the King Caesar House. I hope you have a chance to visit! This is my great, great grand mother. I inherited the Cushman middle name. Great article. Now I know where I got my fondness of accounting. I went to Duxbury once when I was living in Cape Cod. I just had a nice looks arround. I’ve been to the family gravesite in Plymouth to visit my grandmother Frances Hall West and saw Laura West’s grave and Captin Parker is there too. Thank you for the King Caesar House info. Connie – Lura Hall, not the West side of our family! That’s what I meant to say. Laura Hall.